This time of year is, at least in the US, preparation time for the Microscopy and Microanalysis (M&M) meeting. Like most big shows, every attendee has a significant amount of preparation to perform in the weeks (days?) leading up to their travel date. Most readers of this blog will be platform or poster presenters. You may be under stress to collect that last set of experimental data to fill that last hole in the analysis to finalize your presentation. 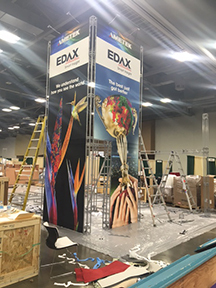 Life is not so different for the commercial exhibitors like EDAX. Unknown to the general participants, there are many departments under similar pressures to ensure a productive meeting for all attendees. Engineering is applying the finishing touches to new products. Software Engineering is approving the latest versions of software for release. 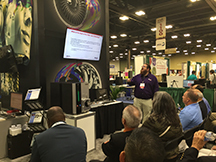 Marketing Communications is contacting current and prospective customers to attend equipment demos and workshops during the exhibition hours. Marketing is receiving the final graphics of product literature for decorating the booth. Service is scheduling engineers to install all the EDAX microanalysis systems in our booth and those of our electron microscope associates. Applications scientists are finalizing their presentations for the meeting but also for the demos and EDAX workshops to be performed in our booth. Logistics is coordinating the hotels for our employees and shipping our equipment both to and from the venue. About the only employees not under stress before the meeting are Sales who coast now but are under the most stress (or is it strain) during the week of the show. The exhibitors may seem very relaxed to the visitors during the show, but that image derives from the total effort that they are putting forth now so that you have the best experience possible. We look forward to seeing all of you in Baltimore, or your next show! Click here for more information about EDAX at this year’s event. ← Crown Caps = Fresh Beer?